New MI PathArray™ assays focus on research area-specific pathways in development and disease, bringing the highest microarray sensitivity to your research. Gene expression analysis is often performed using whole-genome microarrays resulting in very large data sets that generate information irrelevant to the focused researcher. Alternative methods for focused gene expression currently utilize qPCR, but these tools have limited gene coverage due to high assay costs and limited instrument capabilities. 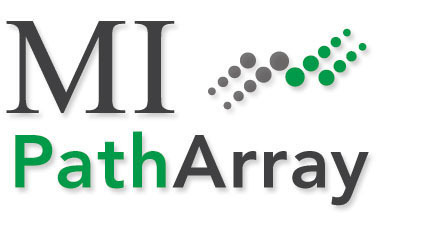 The MI PathArray microarray platform provides an alternative : a focused gene pathway tool with current scientifically-relevant gene content providing manageable data sets for focused analysis in a cost-effective multi-assay platform. Each multi-assay slide includes four discrete, identical arrays containing pathway-specific collection of 70mer oligonucleotides selected through a vigorous curation process from the MI collection of human gene probes. Probes and controls are printed in triplicate in each assay area offering increased sensitivity and statistical power. Control probes for every assay include 17 probes for widely expressed genes (positive controls), 6 negative probes, and a series of 8 probes for use with spike-in controls used to determine the limits of detectability. Designed for use with pre-labeled cDNA derived from total RNA, detailed sample preparation protocols for MI PathArray assays to achieve semi-quantitative results are provided. RNA spike quantities recommended for inclusion included in the reverse transcription and labeling process generate a fluorescence/expression curve to allow semi-quantitative analysis. Hybridization your samples on the MI PathArray is readily accomplished using any commercially-available hybridization systems, or with MI-developed protocols for bench-top static hybridization methods. Additionally, the printed dimensions of the assay areas have been designed to allow for use in the Tecan HS Pro and other commercially available hybridization systems. Each MI PathArray contains a collection of targeted pathway-specific probes from MI’s human gene probe collection. MI PathArray assays provide content that allow researchers to advance confidently from other technologies (including PCR arrays or smaller microarrays) that typically provide fewer probes. Content is selected through a vigorous curation process which evaluates many factors for inclusion. MI PathArray Growth Factor assays include 190 gene probes covering 142 genes to detect more than 390 transcripts. Each gene is identified to play a role in one or more pathways where human growth factors and growth factor-associated genes are involved in a wide variety of biological processes including differentiation and development. To ensure continuity for researchers using more limited assays for growth factors, MI PathArray assays are fully compatible with other popular assays including PCR arrays and other smaller microarrays. MI PathArray Inflammation assays include 737 gene probes covering 677 genes to detect more than 2450 transcripts for human genes identified to play a role in pathways associated with inflammation such as chemokines, cytokines, and inflammatory responses including acute-phase and inflammasome complexes. To ensure continuity for researchers using more limited assays for inflammation, MI PathArray assays are fully compatible with other popular assays including PCR arrays and other smaller microarrays. MI PathArray Apoptosis assays include 1048 gene probes covering 994 genes which detect more than 3600 transcripts identified to play a role in pathways of apoptosis including activators, inhibitors, and other positive and negative regulators of cell death. To ensure continuity for researchers using more limited assays for apoptosis, MI PathArray assays are fully compatible with other popular assays including PCR arrays and other smaller microarrays. MI PathArray Cancer assays include 509 gene probes covering 465 genes which detect more than 1950 transcripts identified to play a role in oncogenesis and the dysregulation of various pathways leading to cancer and metastasis. To ensure continuity for researchers using more limited assays for cancer, MI PathArray assays are fully compatible with other popular assays including PCR arrays and other smaller microarrays. Transcription factors and the regulation of DNA transcription are in focus on this MI PathArray. The MI PathArray Transcription Factor assay expression levels using 946 long oligo probes to cover 859 genes to profile more than 3500 identified transcripts important to DNA transcription, signaling and regulation. Positive and negative regulation of kinases and the positive and negative regulation of MAP, MAPK, MAPKK, MAPKKK, JUN, JNK, JNKK, Janus, JAK2, ERK1, ERK2, and ERK5 kinases are included on this MI PathArray. Follow expression levels of the more than 3,600 transcripts of 907 genes important in kinase activation and regulation. The Kinases MI PathArray assays contain 1013 probes printed in triplicate for each array assay. In addition to the MI PathArray array-specific probe content, 17 oligo probes for genes with high levels of constitutive expression (positive controls), eight RNA spike-in sense oligonucleotide probes, and six negative control spots enable a semi-quantitative analysis of gene expression. Both one- and two- color experiments are supported under these control oligonucleotides. A set of positive control gene probes included on each MI PathArray was designed to include transcripts known to be of high, moderate, and low expression across a variety of tissue types. Expression of each positive control will be RNA-source dependent and can help to gauge expression levels of transcripts of interest in your sample. The following 70mer oligonucleotide probes for constitutively expressed genes are included on each MI PathArray in triplicate (Table 1). Table 1. Constitutively expressed genes included on the MI PathArray for use as positive controls. A minimum of two housekeeping genes are included in each block of the array to demonstrate adequate hybridization of each sample. Negative control probes are also included in triplicate in each block of the array. These spots are made of several 70mer DNA oligonucleotides with absence of complimentarity to known human DNA sequences. These negative control sequences are included in the array to gauge non-specific binding present after hybridization and post-hybridization washing. RNA spike sense oligonucleotide probes are present in triplicate in each block of the array. These 70mer probe sequences, provided by Ambion Inc., are complimentary to the Ambion ArrayControlTM RNA spikes available through Life Technologies (Invitrogen, Ambion, and Applied Biosystems). MI protocols provide guidelines for RNA spike quantities to be included in the reverse transcription and labeling process. These quantities generate a fluorescence/expression curve by which semi-quantitative interpretation can be achieved for your transcripts of interest.